This week, Emily’s school has been raising money for cancer research. At least I think that’s what it’s for. All I know is that she has to bring a dollar so she can wear something “unique” to school. They’ve had crazy hair day, hat day, pajama day, and, today, super hero day. She remember this at 8:00 last night. Had this been for one of the boys, we would have had plenty of choices for a costume. Not so with Emily. She has lots of dance costumes, but nothing that she deemed appropriate for a superhero. So, it was time to hit the internet to see about finding a picture of a female superhero. Of course, she wanted to use her new laptop (my old one) for this search. 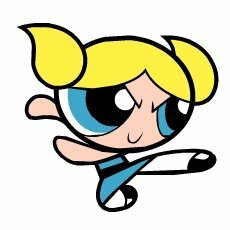 We finally decided that her blue eyes and blond hair lend themselves quite well to dressing up as Bubbles from the PowerPuff girls, the group of supergirls from that cartoon on cartoon network. She and I can count on one hand the number of times she’s actually seen this particular cartoon, but felt it would be easy to turn Emily into Bubbles. All it took was a piece of black felt wrapped around the midsection of a blue sundress, tights, black dress shoes, and a couple pigtails. It was a little cool today for a sundress, so she wore it all over a long sleeved shirt and was good to do. She said nobody at school knew who she was, but she had fun being dressed up. Timothy’s 5th Birthday is 20 days away. Party planning is well underway. We’ve already made the guest list which consists of 10 girls and 2 boys. He’s quite the ladies man. Anyone who asks him how old he is now gets the response, “4 and 5 quarters.” Isn’t that a great response from the son of a couple of math teachers? Scott’s tried to get him to say “4 and 11 twelths,” but he has a hard time remembering that. To hear Zachary tell it, he will soon be four. Nevermind that it’s still 8 months until his 4th birthday. He’s pretty set in his ways these days, and is not afraid to let us know exactly what he wants. He’s pretty easy to please, as long as he gets something green. Breakfast will not be eaten with anything except the green spoon. Juice will only be drank with the green straw. If it comes in green, he wants it. Try green food dye in your scrambled eggs or milk. We’ve done this on St. Patrick’s Day as well as after reading “Green Eggs and Ham.” We also put green food dye in the water of our mac n cheese. Three little drops make a huge difference!